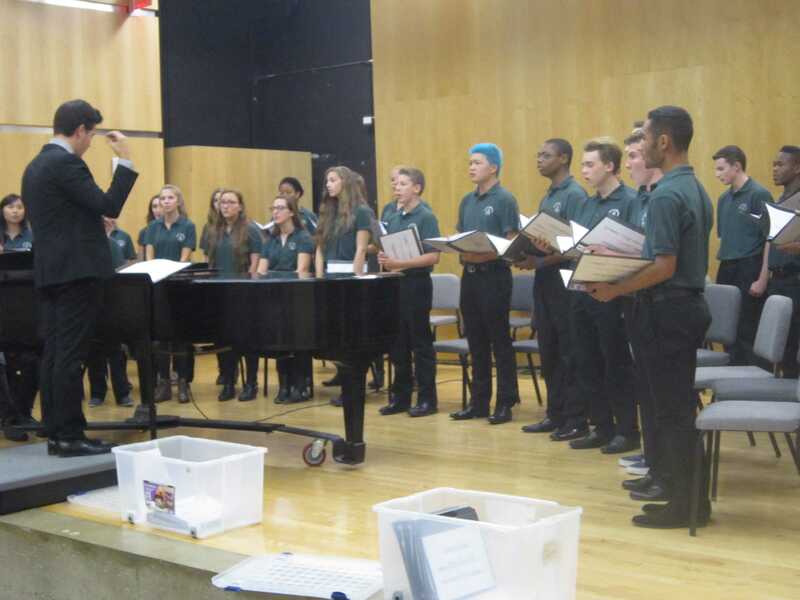 Brimmer and May’s upper school choir, Greenline, performed at UMass Amherst on Oct. 11. Before the event, journalism students Anders O’Neill ’16 and William Ma ’17 spoke with Greenline Choir Director Frank Van Atta about the year ahead. “We’re going to be traveling a lot more in the greater-Boston community and across the country as well,” says Van Atta. Greenline Choir Director Frank Van Atta conducts a performance at UMass Amherst on Oct. 11. Q: What can we expect from the upcoming season of Greenline? A: I’m very excited for Greenline this year because of the different performance opportunities that we have. I was able to schedule a lot more this summer. In addition to the things that we normally do, like our holiday concert, thanksgiving concert, and spring concert, we’re going to be traveling a lot more in the greater-Boston community and across the country as well. Q: Greenline is performing its first competition concert next week on October 11. How big of a deal is this? A: It’s a very big deal for us—especially for the size of the school. I’m most proud of the different types of students that we have in Greenline. For the school of our size, our creative arts program is really large, which I absolutely love, so it says a lot about the type of community here at Brimmer that we’re able to do that. But I also think that it speaks a lot about Greenline in that I feel really confident in our ability to do well and to represent the school in a positive way. Q: This year, we have the largest group of Greenline students ever. What are the difficulties of performing with such a large group? A: Space is always an issue. We are hoping to sing for the NAIS conference, which is the National Association of Independent Schools in January. In the spring semester, we have over fifty students. Space and things like transportation will become something that we just have to be aware of. But one advantage to that is that we can do more complex music. Q: What’s it like to work with so many enthusiastic and talented students? A: It really is why I do what I do. It’s a thrill and honor for me to be able to conduct such a diverse group. One of the things that I love most about Greenline, and that I’m most proud of, is that we have students who are really invested in music, athletics, and visual arts. It’s great to have that different group of people come together and make such a unique family. It’s just a joy for me, and I really love seeing those students who have exceptional music abilities grow even stronger—and those who have never sung in a choir before develop basic skills and learn what it’s like participating in a ensemble. Q: How have yours students grown as musicians? A: I am immensely proud of Greenline. It’s funny, I went to a conference this summer and there were teachers who I had not even met or talked with who knew about Greenline and what we were doing. I think that translates into high expectations for my singers, but they have always lived up to and always fought through difficulties to be able to get there. I am honored to be able to conduct such a group and it’s a joy of coming to school everyday. Q: Any last word of advice for your Geenline students this year? A: Just to be focused and continue to be positive members of the Brimmer community. I love all of the different things that they are involved with and I want Greenline to be a part of that. I love seeing those sports emails when there are of people in Greenline who scored goals, or when I see the play cast list and Greenline members are the lead roles. So, I want them to continue to be positive members of the community, and, of coarse, to always sing well. This entry was posted in Arts, Creative Arts and tagged Alexis Iffil, Arts, Frank Van Atta, Lachlan Davidson, Tony Ni. Bookmark the permalink.